Register to view full webinar: http://forms.avid.com/forms/postaudio.... Join Avid specialist Jeff Komar, as he demonstrates how sound can play a vital role in setting the mood of a scene, and help drive the story. With horror hit My Bloody Valentine as the film canvas, learn the techniques for designing, editing, and mixing sounds with Pro Tools HD 8, ICON D-Command, and Video Satellite technology. 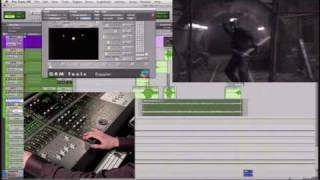 This is a short excerpt from the Avid/Digidesign ICON webinar series on the ICON D-Command and Pro Tools HD Sound Design and mixing for TV and Film.